A realtor’s database is the most valuable tool in their business yet the majority of agents out there don’t have one or actively maintain it. The hardest part of generating a database is getting started. 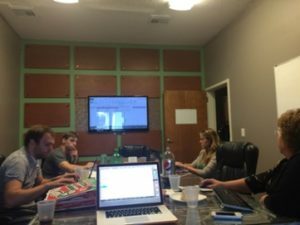 As I write this article, my team is building and updating their database over pizza at 7pm productivity night. The goal is to add 100 new contacts tonight for an email blast scheduled to go out tomorrow morning. Creating a database is simple but agents don’t know how much value they have right under their fingertips. If you use email and social media, your database is so much larger than you think. Here are the best hacks I have found to generate a huge list in less than 1 hour of your time. Step 1 – Don’t screw up the spreadsheet. If your database is simply in excel, make sure you build it within a structure that can easily be imported into a more powerful database. If your goal is to one day move up to Salesforce.com, make sure your template columns matches their template for easy uploading in the future. You may need to break up the full name or the address into parts. Don’t worry about finding every piece of information about a user. Email address should be the priority. Step 3 – Harvest your Email Contacts. Whether you use Outlook, Yahoo or Gmail, there is an easy way to export the email addresses of anyone who you have had contact with since you opened the account. Use your email’s “Help Tool” to learn how to export your contacts into a CSV file. Once you’ve downloaded, it’s easy to combine these columns to your master database spreadsheet. Step 4 – Bring in help from your family. If you’re anything like me (male with a short attention span), you’re hopefully married to a responsible woman who makes sure that Christmas cards get sent out and still has a copy of the old wedding invitation list. All of your closest friends emails and contact information probably exists somewhere in your home. Don’t forget to go searching for it. Step 5 – Hire help to clean it all up. At the end of the contact collaboration, you’ve invested an hour of your time and generated several spreadsheets in all sorts of different formats. Your time is better spent working on listing and selling homes than doing administrative, mind numbing work. Hire a Real Estate or Non-Real Estate Virtual Assistant through Upwork.com or similar site to clean up your list on your behalf. It will likely cost you less than $100. There you have it. A giant list of your contacts in less than 1 hours work for under $100. Don’t forget to continually add contacts and dedicate some time to filling in the gaps of those contacts who are missing information. Next step, actually do something with this list by creating your marketing plan for emailing and contacting these users. Good luck!